Wide band-gap semiconductors such as GaN and related materials are making inroads into power electronics applications realizing a significant power efficiency gain over Silicon based solutions. The automotive industry is an important use example for an accelerated adoption of these next generation semiconductor materials. The next generation mobile communication standard 5G utilizes the outstanding material properties of GaN to enable higher data rates and several more advantages. Employed in traction inverters of battery electric vehicles GaN based circuits lead to longer driving range or reduction of battery size for system cost optimization. GaN based AC-DC on-board chargers can be designed with a smaller factor when operating at higher switching frequencies due to smaller passive components and reduced cooling efforts. Charging infrastructure is upgraded with DC charging poles of several 100 kW of power to allow for faster direct charging of the vehicle battery which is expected to greatly improve consumer adoption. Therefore, the wide bandgap semiconductor content, in particular SiC or GaN, in next generation automotive applications will be growing strongly, which is resulting in investments into wide bandgap material supply chain and device manufacturing capabilities worldwide. This market demand drives our present epitaxial production roadmap as discussed here. The focus of epitaxy production technology developments has been put on productivity enhancements concepts like wafer level automation, in-situ metrology to acquire process data for smart system control and predictive maintenance concepts. Employing cassette-to-cassette wafer loading leads to a drastic reduction of process cycle time of up to 50% through hot wafer loading. By designing in an optical path to the growing wafer surface we have succeeded in establishing emissivity corrected pyrometry for on-wafer temperature measurement. This metrology enables wafer level control for process and epi yield optimization as well as for introduction of smart system concepts. Using a gas driven wafer carrier (satellite) rotation the surface temperature of each wafer can be tracked individually and can be adjusted by an N2/H2 gas mixture for temperature uniformity control during the process. A software based automatic correction of the gas flow to the individual satellites minimizes the mean surface temperature deviation of each wafer for each process step. We will report on the benefits of this technology to the optimization of epi layer properties like mean thickness and doping concentration within an 5×200 mm process run. GaN on Silicon for power and RF applications has demonstrated technological maturity. Rather the economical rational of how to improve cost efficiency in the material and device production is considered to be the obstacle for the faster adoption today. We will present our recent work performed in a G5+ C Planetary Reactor® for high volume manufacturing of GaN based devices on 150 or 200 mm Si. To achieve high buffer breakdown voltages up to 1KV and low dispersion, suitable buffer technologies as well as carbon doping schemes will be discussed. Prof. Dr. Michael Heuken was born in Oberhausen, Germany on November 17, 1961. He received the Diplom‑Ingenieur degree and the Dr.‑Ing. degree in Electrical Engineering from Duisburg University in 1985 and 1989, respectively. 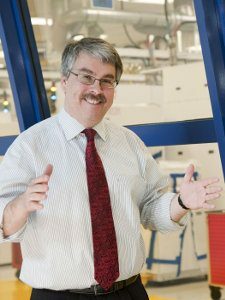 He joined the Institut für Halbleitertechnik at RWTH Aachen as senior engineer and has been working in the field of metalorganic vapor phase epitaxy for electronic and optoelectronic devices. In 1994 he finished his Habilitation in semiconductor technology and devices with a thesis on MOCVD technology for optoelectronic devices. Since then and still at present he has been lecturer for semiconductor technology and devices as well as circuits for communication systems at RWTH. In 1997 he joined AIXTRON AG in Aachen-Germany where he is now Vice President Corporate Research & Development. In 1999 he was honored as Professor at RWTH Aachen. His main experience is in the fields of semiconductor growth by MOVPE, Nanotechnology, electronic and optoelectronic devices and circuits. Prof. Heuken is author and co-author of more than 650 publications in international journals and several invited papers at international conferences. He was President of DGKK (German Crystal Growth Association), he is elected Executive Committee member of the IOCG (International Organization of Crystal Growth), member of VDE/ITG and was board member of OptechNet e.V. and EPIC. He acts as referee for international Journals. He has been granted several patents in the field of semiconductor technology. More than 250 publically funded projects were successfully managed by Professor Heuken.